Dante’s Comedy is written in terza rima — that is, a rhyme scheme of aba bcb cdc ded efe … yzy z. One very appealing feature of terza rima is that each tercet is linked by rhyme to both the tercet before and the one after, making it possible to write an entire canto — arbitrarily long — which is one seamless whole, impossible to break into smaller units which can stand alone in terms of rhyme. Unfortunately, terza rima just isn’t workable in English, at least not for long poems. It requires that every line of the poem rhyme with two other lines, and in a rhyme-poor language like English that is just too stringent a requirement (though of course it works fine in Italian). Reading Dorothy L. Sayers’s terza rima translation of Dante has made me even more sure of this. Too many forced and awkward rhymes, too many near-rhyme compromises. Many of the “rhymes” (like rhyming — no joke — here, singular, and far!) don’t even register as rhymes at all unless the reader is actively paying attention to the rhyme scheme, and in the end the effect is simply not that of reading rhymed verse. I know Sayers is operating under the additional constraint of having to write English terza rima which is a translation of Italian terza rima, but I think even writing original verse using this rhyme scheme would be unworkable in English, unless it were very short. 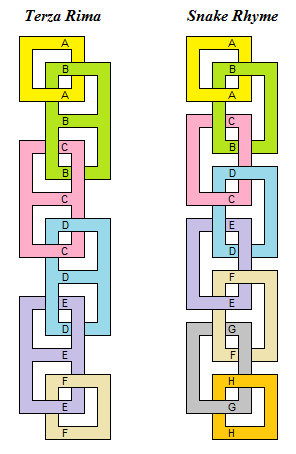 Structurally, terza rima is like a chain, every link of which has the shape of a figure-eight. The easiest way of adapting it to a rhyme-poor language like English, then, is to simplify it to a chain with ordinary circular links, eliminating the need for triple rhymes. I experimented a bit with this scheme when I was a teenager, before I knew anything about Dante, and I called it “snake rhyme” because it could be used to produce an arbitrarily long, indivisible poem. As an experiment, I tried rendering the beginning of the Inferno in “snake rhyme.” The main disadvantage of snake rhyme, as opposed to terza rima, is that every line is separated from its rhyme by two intervening lines, making the rhymes less obvious. I tried to ameliorate this by shortening the lines to four feet each — that makes for 32 syllables per quatrain, very close to Dante’s 33 per tercet. I’m not sure how successful the result is. I have no intention of finishing this “translation” (if one can even use that word for a version which takes so many liberties, and whose author is ignorant of Italian); it was just an experiment. But I thought I’d share it for what it’s worth. So dark my path was lost to view. fresh fear would kindle even now. I’ll shy not from the darker things. Within that dense and savage wood? When lost I the true path? Who knows? I was so very full of sleep. Directs them in the way to go. Had lurked within my bosom’s lake. None else had lived to do the seeing. My firm foot was the lower one. And covered with a spotted hide. Or made to move, I spotted him. Retreating to my starting place. I saw a lion on the slope! For Dante, hope is the one thing needful. On the lowest terrace of Ante-Purgatory — that is, the lowest possible level for a soul whose ultimate destiny is salvation — Dante and Virgil meet Manfred of Sicily. According to the (perhaps unjust) accounts by which the poet Dante knew him, Manfred had been a moral monster, excommunicated by the Church and denied Christian burial. Among other enormities, he had allegedly murdered his own father, brother, and two nephews, and attempted the murder of a third nephew. In other words, he would ordinarily have been condemned to the very lowest Circle of Hell, to the realm of Caïna, as one guilty of treachery against his own kin. Manfred, however, repented at the moment of death — or perhaps it was not even repentance in the usual sense of confession and contrition. He says simply “I gave myself back” (io mi rendei) to God. myself to Him who willingly forgives. who ever would return, imploring It. return — as long as hope shows something green. The choice of words is highly significant: not “as long as he repents” or “as long as he dies with the name of Jesus on his lips” or anything like that, but “as long as hope shows something green” (mentre che la speranza ha fior del verde). Manfred died in the hope of salvation, and it was that — rather than repentance per se — which saved him. Having noticed this, I now find an emphasis on hope jumping out at me from many different parts of the Comedy. It is mentioned again and again in the first canto of the Inferno, when Dante confronts the three beasts. The leopard “gave me good cause for hopefulness,” but “hope was hardly able to prevent the fear I felt when I beheld a lion.” Then, when the she-wolf appears, “I abandoned hope of ever climbing up that mountain slope.” And of course every cantica ends in the word “stars” — a traditional symbol of hope. I am not yet ready to comment on Dante’s ideas regarding hope — I want to go through the whole Comedy again and spend some time digesting it — but I just wanted to point out an aspect of Dante that I had never noticed before.